As the first semester ended and the second half of the year loomed ahead I was feeling in need of some EFL inspiration. 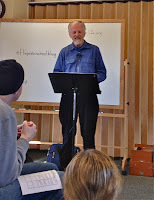 Luckily, Nitai’s four day visit to the Palo Alto Living Wisdom School (LWS) began with his talk on Consciousness in Education this last Saturday. Forty parents and educators attended from many private and public schools for a very full classroom. Students from the Living Wisdom high school also came to inspire everyone with their lovely music. Unfortunately, I missed the Monday visit to the school, which included more students from both the LWS middle school and high school from Nevada City, CA. However, I had the chance to visit LWS on Tuesday while Nitai was still there. I visited the different classrooms and found ideas, insights, and creativity. The LWS Palo Alto students, inspired by the music of the older students from Nevada City, performed their own wonderful music while I was there. When I returned from my visit I told them about how the LWS students start their day with yoga exercises and meditation. I wanted to have my students also start the class with yoga and relaxation. This news was greeted with a few dramatic groans by some and enthusiasm by others but I could tell they were all curious. Since we are now studying India, Hinduism, and Buddhism in social studies this was right on target with the curriculum. This week at the beginning of class we practiced 5 minutes each day of hatha yoga - doing Tadasana (Mountain Pose), Chandrasana (Moon Pose), and Trikonasana(Triangle Pose). We are only doing the standing poses for now, mainly because of space limitations. The yoga was followed the first day by 2 minutes of meditation while the students watched the breath (they thought this felt like a long time). The second day we tried 3 minutes. I did this with both my morning and afternoon class with varying results. 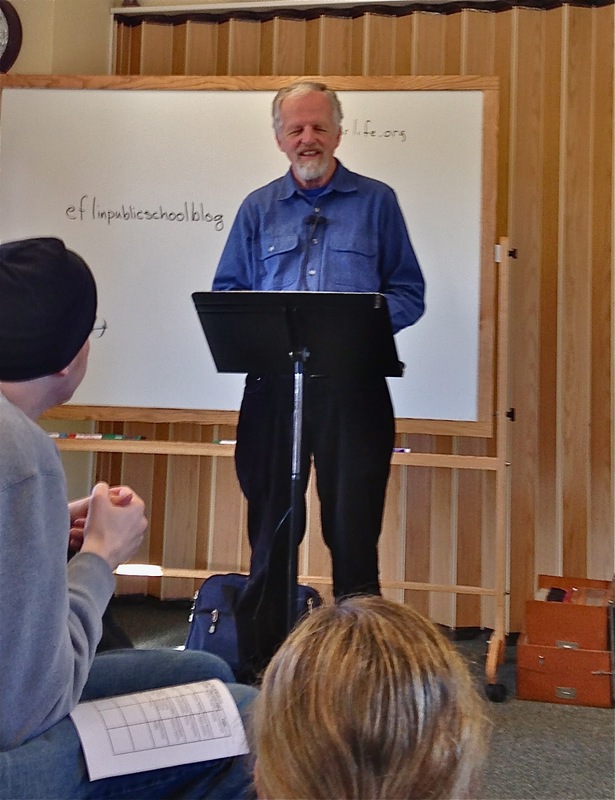 The most successful was the afternoon class where roughly 90% of the students seemed to do it with ease. The students want to increase the number of minutes that we relax or meditate and I plan to continue with this throughout the school year. I’ll let you all know how it goes. I also shared with them the concept of “energy”. I told them that at the LWS school the teachers and students talked about the “energy level” of the students, teachers, classroom. 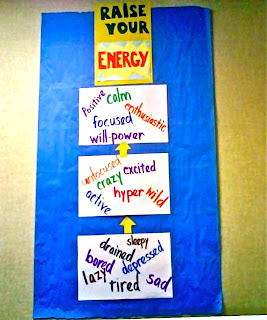 I asked them what they thought “energy” meant in this context and using their words and vocabulary (with a bit of guidance) we came up with a chart for describing the different energy levels that we experience in ourselves. 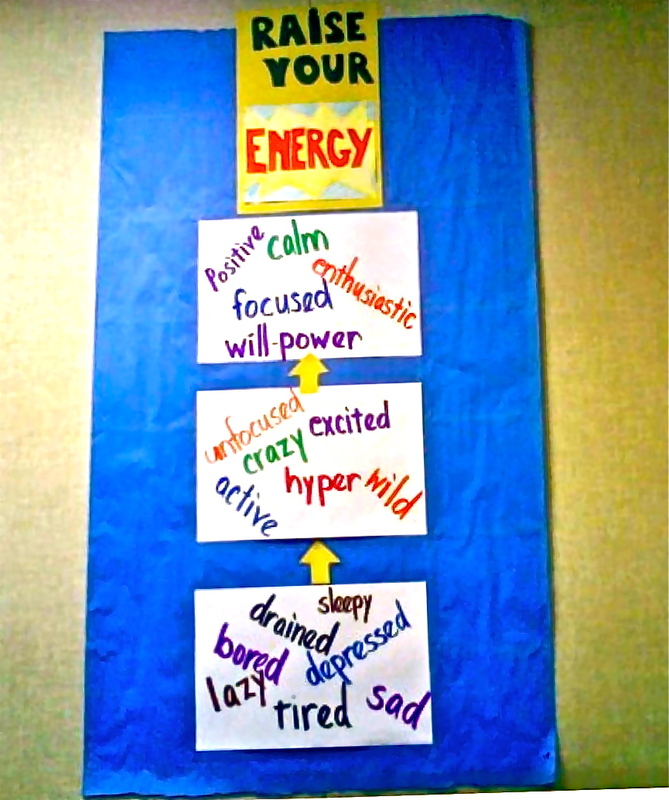 I made a chart for the wall because I will be referring to that concept and using the vocabulary we developed to help them focus their energy throughout the rest of the school year. I tied it all back to the ‘Personal Excellence Qualities’ that we have talked and written about all year, explaining that the highest levels of our energy are represented by those high qualities. We will continue to explore this useful concept of energy.